Alameda Mayor Trish Spencer’s first few months in office have been turbulent and highlighted by extremely lengthy meetings and passive aggressive comments amount council colleagues. ALAMEDA CITY COUNCIL | After viewing a video recording of the March 3 Alameda City Council meeting, blogger Lauren Do called it “my all-time favorite TV show episode.” Do favorably compared the meeting’s entertainment value to one particularly melodramatic episode of The Real Housewives of Beverly Hills. 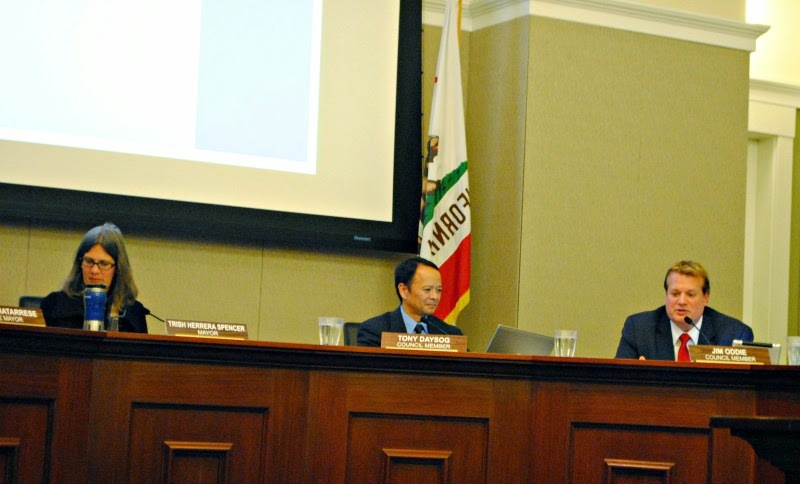 What she found so painfully watchable was the dysfunction that she believes typifies city council meetings since the election of Mayor Trish Herrera Spencer. Do uploaded and annotated a two-minute YouTube video clip. As senior city staff members quietly huddled to answer some questions from council members, former Board of Education candidate Kurt Peterson approached the other side of the council dais and talked to the city clerk in an apparent effort to reopen public comment. Several council members looked exasperated by this unscripted interruption. Posted in Adam Gillett, Alameda, Alameda City Council, Alameda Firefighters, Alameda Magazine, John Russo, Kurt Peterson, Lauren Do, Marie Gilmore, Rod Gilmore, Trish Spencer. Bookmark the permalink.